Most of the establishments in the capital, including shopping malls, educational institutions and hospitals, where a large number of people gather every day lack necessary fire safety measures, posing risk of deadly accidents. City dwellers fear that the establishments devoid of the safety measures may turn into death traps if any fire breaks there. The Fire Protection Act 2003 requires all buildings, be it commercial or residential, to have sufficient firefighting equipment. But most of the buildings do not have enough safety equipment, emergency exits and sufficient spaces between adjacent buildings to fight fire. Many are worried about the inadequate fire safety measures in commercial high-rises and other establishments. Panic spread after 26 people were killed in a devastating fire at FR Tower in Banani area of the capital on Thursday. The high-rise has no fire exits. Another fire broke out in a Gulshan market of the capital a day after the Banani tragedy that stunned the people. Mozammel Haque, former deputy director of the Fire Service Civil Defence (FSCD), told the Daily Sun that buildings need basic fire safety facilities such as fire detection and alarm systems, extinguishers, hose reels with water connection, fire escape route, accessible road, reservoir with adequate water reserve, safe shelter and fire-fighting teams. Most of the high-rise buildings have been built here in violation of the original design. The owners show proper fire safety measures in the original design, but change the plans during construction. While conducting a survey of 3,786 establishments in 2017, the FSCD found that 1069 had no fire safety measures (extremely risky) and 2,588 had some fire-safety measures (risky). Only 129 were identified as satisfactory. The establishments include schools, colleges, universities, shopping malls, banks, hospitals, media centres and residential hotels. Then, the FSCD sent letters to the risky establishments, asking the owners to strengthen the fire-fighting system within a month, but no company did it. At the year-end, the FSCD conducted another survey of 3734 establishments here and found 1066 establishments extremely risky, 2583 risky and only 85 satisfactory. After the survey, the FSCD are now sending final notice to those establishments for strengthening their fire-fighting systems. In the final survey, the FSCD inspected 1,305 private and state-run malls, supermarkets and kitchen markets and found 622 extremely risky and 678 risky. The very risky shopping malls include Chadni Chowk, Gulshan Tower, Bangabazar Complex, Polwel Super Market, Mirpur Shopping Complex, Shyamoli Garden and Lalmatia Aarong Market. They visited a total of 423 hospitals and clinics across the capital. Of them, 311 were risky while 105 extremely risky. The hospitals include Dhaka Medical College Hospital, Mitford Hospital, National Institute of Chest Disease and Hospital, National Institute of Cancer Research & Hospital (NICRH), United Hospital, LabAid and Ibn Sina. FSCD officials visited 336 residential hotels in the capital and found 21 extremely risky and 305 risky. 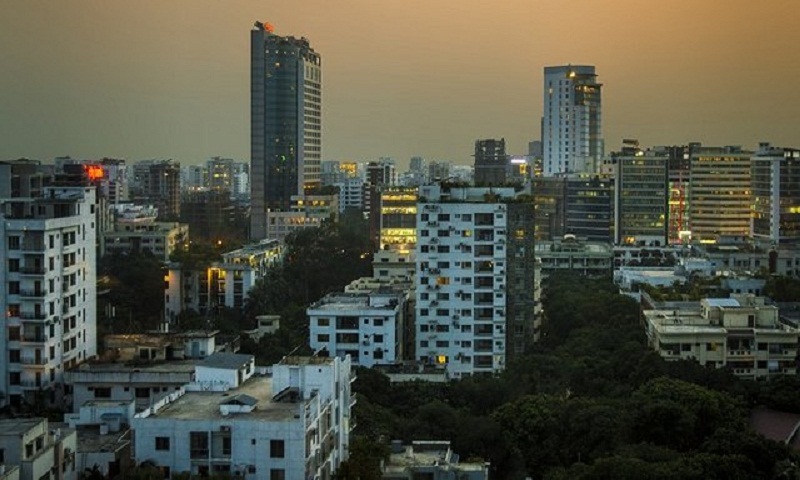 The extremely risky hotels include Radisson Blu, Le Meridien, Dhaka Regency Hotel and Resort, Tea Tree Hotels & Resorts, La Vinci Hotel and Royal Grand Hotel. A total of 576 banks were inspected and only 50 banks found satisfactory in fire safety measure while three banks were extremely risky and 523 were risky. The head office of Sonali Bank, the head office of NCC Bank and the head office of Bangladesh Krishi Bank were among the risky banks. During the inspection of 1074 educational institutes FSCD officials found 295 educational institutions most risky for fire while 766 were risky. The most-risky educational institutions include Dhaka University, Government Shaheed Suhrawardi College, Kabi Nazrul Government College, Government Bangla College, Habibullah Bahar University College, BRAC University and Daffodil International University. The FSCD directorate has repeatedly sent letters and notices to strengthen the fire-fighting system, but the authorities concerned are indifferent to it. These buildings met with the about 80 percent of the fire incidents in the capital, according to the FSCD headquarters. According to the Bangladesh National Building Codes (BNBC), a building having six storeys is a high-rise. The owners must follow fire safety rules and install fire-fighting equipment. Before completing the construction work, they should take an approval from the fire service. Khurshid Anwar, a senior station officer at the fire service and civil defence, said before constructing more than six storeys of a building, NOC (no objection certificate) is mandatory. According to the FSCD, some building owners did not implement the requirements although they managed the NOC before construction. On the other hand, some of the owners did not care about the fire department certificates while building their structures. “Fire safety measures in those buildings can be ensured and strengthened through corrective measures,” he added. He also said: “Most of the buildings have been constructed, flouting building codes, and there is none to oversee it. “Fire safety measurements should be checked every year. Because, most of the high-rise buildings haven’t check their fire safety measures for years,” he said.